This section explains the benefit you earn for your covered employment in 1987 and later under the contribution account benefit formula. Your contribution account benefit is based on your covered employment after 1986 up to your pension effective date. You earn a percentage of all the basic contributions covered employers make for your covered employment after 1986. If you join the Plan in 1987 or later, all your retirement benefits are calculated under the contribution account benefit formula explained in this section. If you joined the Plan before 1987, your benefits are earned under two different formulas: The five-year average benefit earned for your covered work through 1986 (explained in the Five-Year Average Benefit section) and the contribution account benefit earned for your covered work in 1987 and later (explained in this section). Under the contribution account benefit formula, you earn a monthly retirement benefit based on a percentage of the basic contributions your employers make for all your contributory service (covered hours) after 1986. This is called your contributory service benefit. In most cases, your contribution account benefit equals your contributory service benefit. However, if you first join the Plan after 1986, you may also qualify for a non-contributory service benefit based on your employment before you entered the Plan. Or, if you rejoin the Plan after 1986 as part of a new bargaining unit, you may qualify for a non-contributory service benefit based on your employment between your two periods of covered employment (see Non-Contributory Service Benefit Based on Intermediate Employment). If you qualify, your contribution account benefit equals the total of your contributory service benefit plus your non-contributory service benefit. There is no maximum to the benefit you can earn under the contribution account benefit formula. Your benefit grows each month that your employer makes contributions to the Pension Trust on your behalf. The Internal Revenue Service does place a maximum on the total monthly benefit you can receive from this Plan. See Federal Limit on Benefit Amounts where this limit is discussed. All basic contributions your employer makes for your covered work count toward your monthly pension. But remember to check if your collective bargaining agreement limits the number of hours your employer is required to contribute on your behalf. 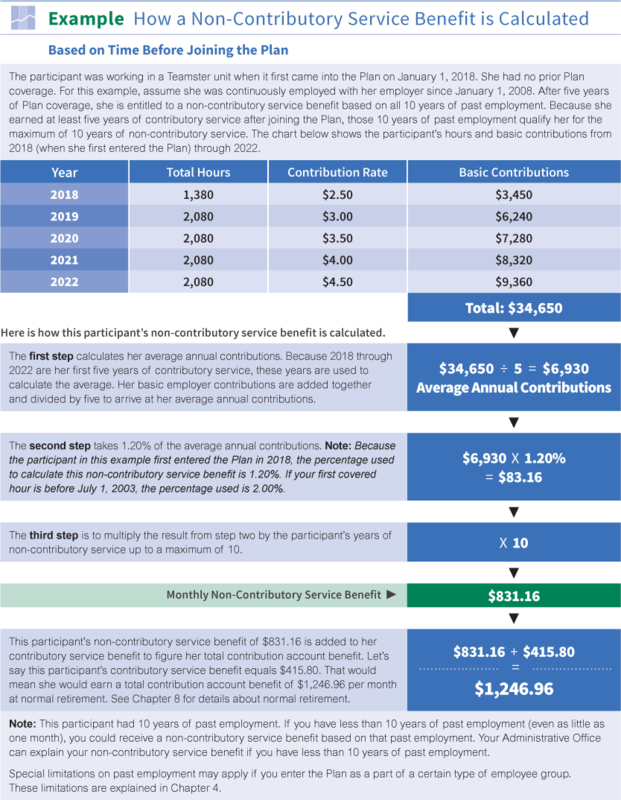 Beginning in 1987, you earn a contributory service benefit that is a percentage of all the basic contributions your employers make for your covered hours after 1986. Your contributory service benefit is calculated by multiplying all the basic contributions your employers pay into the Pension Trust for your covered employment in each calendar year after 1986 by the benefit percentage that applies to that year. The results from all of those years are then added together to arrive at your total contributory service benefit. The benefit percentage is not the same for every year. The benefit percentage for some years depends on whether your covered employment in that year occurs during your first 20 years of service or comes after your first 20 years of service. Years of service are explained next. Click here to see the specific benefit percentages that apply to each year of covered employment from 1987 forward. Your years of service are only used to determine when you cross the 20 years of service line. You cross that line at the end of your 20th calendar year of service. Each calendar year that ends during your period of unbroken past employment, up to a maximum of 10 years. Click here for details. Each calendar year of vesting service that ends on or after your first covered hour under the Plan. Click here for details. You cannot earn more than one year of service during a calendar year. Although only basic employer contributions for your covered employment after 1986 count when calculating your contribution account benefit, all your years of service—before and after January 1, 1987—count when adding up your years of service. This also includes years of vesting service you earn based on non-covered employment. 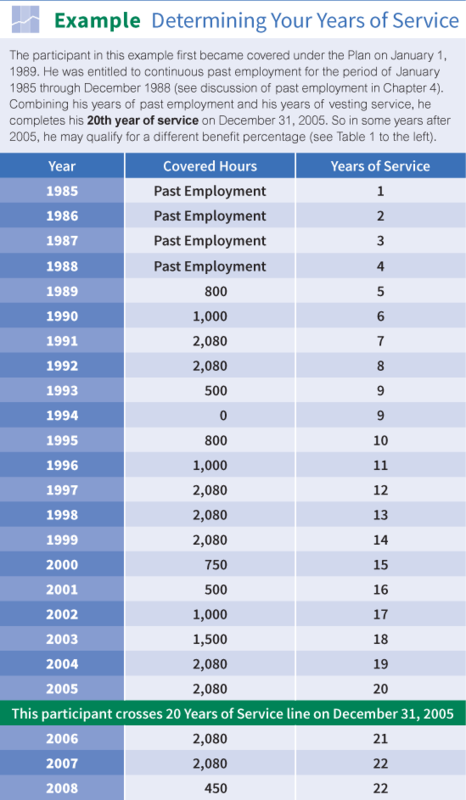 Click here for an example of how to determine your years of service. Your contribution account benefit is based on all your covered employment after 1986 up to your date of retirement. 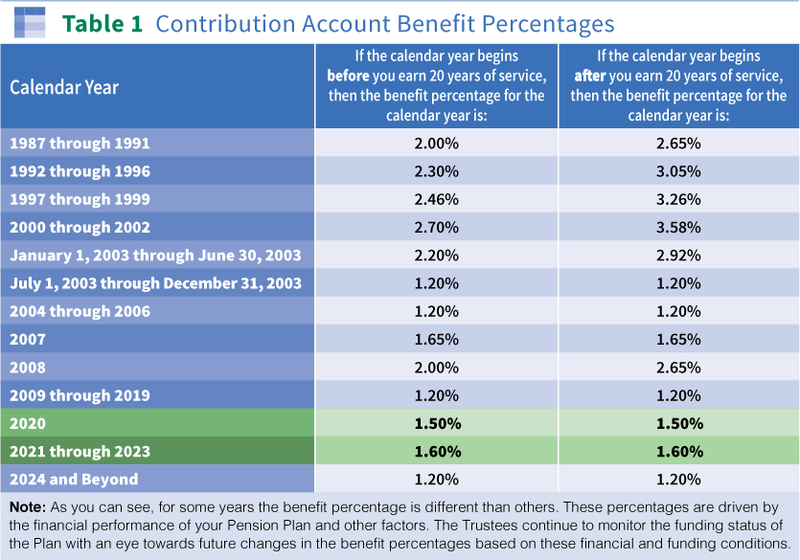 Remember, if you joined the Plan before 1987, your retirement benefit is based on the combined total of your contribution account benefit and your five-year average benefit (explained in the Five-Year Average Benefit section). 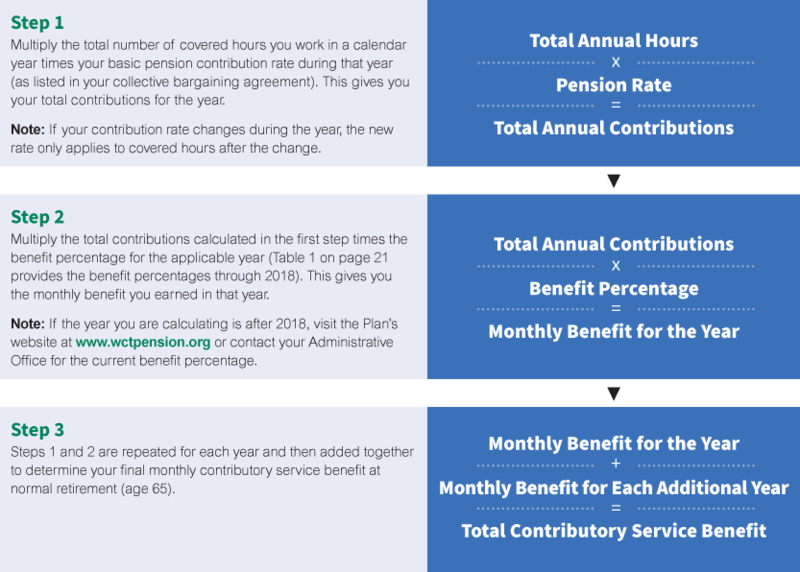 Table 2 gives you an easy way to estimate the monthly benefit you can earn each year based on the basic contribution rate that applies to your covered hours during that year (as listed in your collective bargaining agreement). Total Covered Hours—How many covered hours did you work in a year? 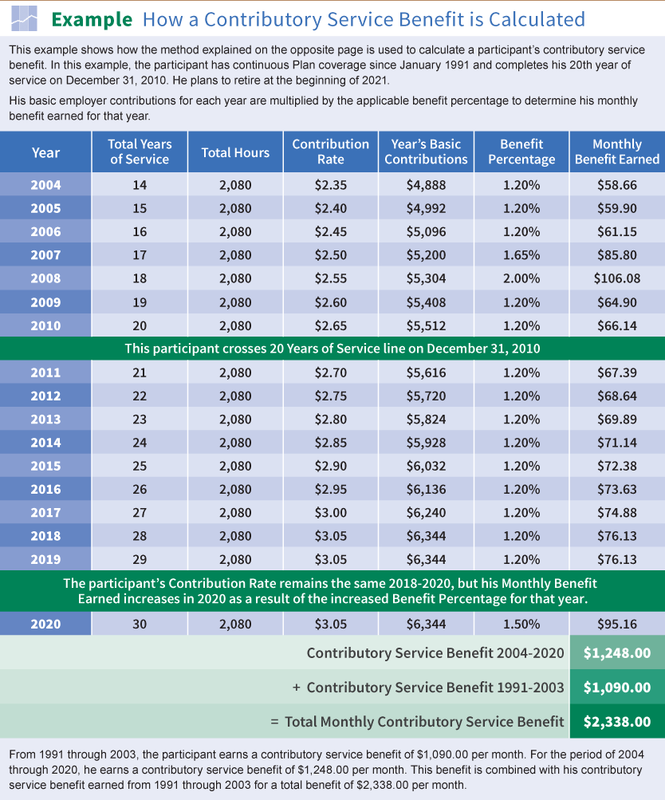 Pension Rate—What is your basic pension contribution rate during the year? Benefit Percentage—What is the benefit percentage for the year? Click here for three steps that show how a contributory service benefit is calculated. Your basic contribution rate is set in your collective bargaining agreement. It does not include supplemental PEER contributions that your employer may be required to make. See Types of Contributions for more information. Most contracts have monthly or yearly maximums on employer contributions. See Covered Hours for more information. Click here for an example that shows how a contributory service benefit is calculated. If your first covered hour in the Plan is after 1986, you may qualify for a non-contributory service benefit based on your past employment as described in the Past Employment and Intermediate Employment section. Your non-contributory service benefit is based on your total years and months of past employment and intermediate employment. Click here for an explanation of past employment and intermediate employment and limits on how many years can be used in calculating your non-contributory service benefit. You must complete at least one year of contributory service in a calendar year that ends after your first covered hour and before your 10th anniversary under the Plan. Note: If you leave covered employment and rejoin the Plan after 1986 as part of a new bargaining unit, you may also be eligible for a non-contributory service benefit based on your intermediate employment. Click here for the rules that apply to this type of non-contributory service benefit based on intermediate employment. You cannot earn more than 10 years of non-contributory service (in some cases, the maximum limit is 5 years). Click here for information about the limits on past employment. Also, your total years of non-contributory service cannot be more than twice your total years of contributory service. Put another way, every year of contributory service you complete converts two years of your unbroken past employment into years of non-contributory service. This is sometimes called the two-for-one rule. For example, suppose you enter the Plan with nine years and two months of unbroken past employment. You leave the Plan having completed four years of contributory service. Under the two-for-one rule, you are limited to eight years of non-contributory service because that’s twice the number of your years of contributory service. Continuing with this example, if you leave the Plan with five or more years of contributory service, you qualify for nine years and two months of non-contributory service. Under the two-for-one rule, your limit is either 10 years (twice the number of your five years of contributory service), or your total period of unbroken past employment, whichever is less. Remember, you can never qualify for more than 10 years of non-contributory service. Note: In some cases, the maximum past employment you can earn toward your non-contributory service benefit may be less than 10 years (as explained above under Special Limitations on Past Employment. Each calendar year in which you complete at least 500 covered hours counts as one of your years of contributory service. If you leave covered employment and later rejoin the Plan after 1986 as part of a new bargaining unit, you may be eligible for a non-contributory service benefit based on your intermediate employment. The rules are explained in the section on intermediate employment. The formula for calculating a non-contributory service benefit based on intermediate employment is similar to the formula used for calculating a non-contributory service benefit based on past employment as explained earlier in this section. The same maximum limits on past employment also apply to your intermediate employment. 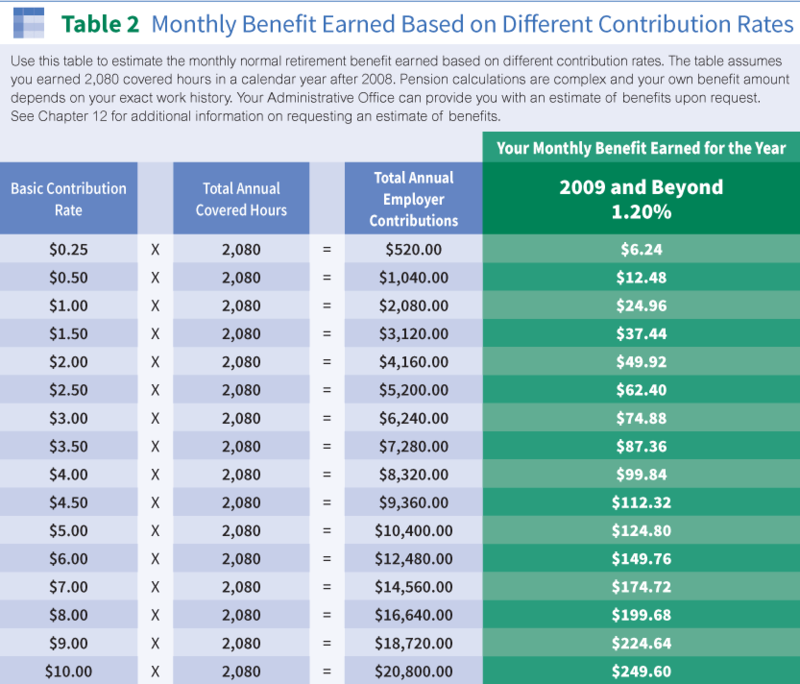 In addition, if you receive credit for years of past employment under the Plan’s five-year average benefit formula or contribution account benefit formula explained earlier in this section. The maximum limit on your intermediate employment is reduced by your years of past employment. Your Administrative Office can provide more information about how this benefit is calculated and whether you qualify. Step 1—Calculate the average amount of basic contributions paid for your covered employment in each of your first five years of contributory service (years when you earned at least 500 covered hours). Contributions for calendar years that begin on or after your 10th anniversary under the Plan cannot be used to calculate your non-contributory service benefit. Step 2—Take 1.20% of your average annual contributions from Step 1. This amount determines the value of each year of non-contributory service you have earned. If your first covered hour under the Plan is before July 1, 2003, the percentage used to determine your non-contributory service benefit is 2.00% rather than 1.20%. Step 3—Multiply the result from Step 2 by your years of non-contributory service. The result from Step 3 is your non-contributory service benefit. Add this amount to your contributory service benefit to determine your total contribution account benefit. Click here for an example of how a non-contributory service benefit is calculated.